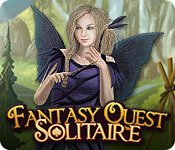 Fantasy Quest Solitaire is rated 4.0 out of 5 by 9. Rated 5 out of 5 by IsisRising from Great Game Ok I only played this for 30 minutes and knew that I had to add it to my collection. With different options for playing (Easy,Timed) this makes for a great game of solitaire. The story line is interesting and so is the game play. The added mini games make it even more fun.This is a must have! Rated 5 out of 5 by raydog from Love this game!!! These are the people that gave us Zombie Solitaire and it is similar and that makes me love it even more! I love the side games - those crazy fairy girls - the match three - the hidden object! This is just perfect! I wandered around for a while trying to figure out how to clean up the water for these same crazy fairy girls until I got the entire match thing! Match - as in lighting a fire! Rated 5 out of 5 by camgold from Good Solitaire I love solitaire games and this is one of the best I have played in quite a while. It is challenging enough and visuals are good. Rated 4 out of 5 by yel65sel from Fairy fantasy solitaire really like this solitaire game, but then I like solitaire games anyway. This one has a reasonable amount of challenge, enough to make it interesting. the mini games are good and break up the game. the choice of two game levels is great as I like to take my time and relax when playing games. 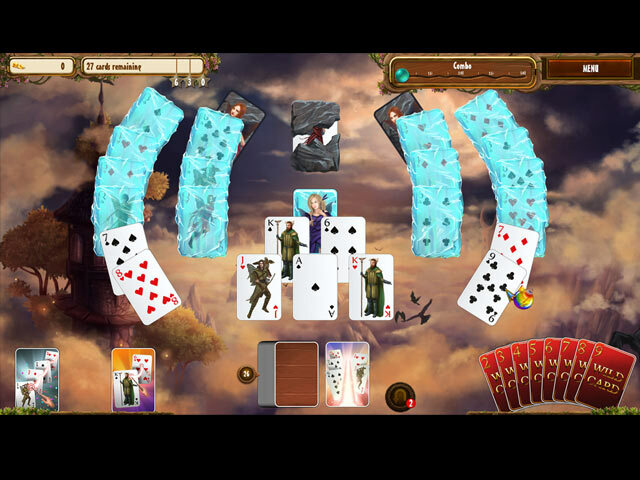 I do recommend this game for those who like a solitaire game to go into a relaxing fantasy realm. Rated 3 out of 5 by verimeri from could have been better The mini games were fun. The overall game play was fun. However, some levels had very few cards in the deck. Levels 61,82,96 were only possible with the use of power-ups. Even that I could have dealt with but what really irritated me was I went back and played every level to get three stars and I still did not get all the stickers. That is a glitch the developers should not have allowed to happen. For that reason I cannot recommend this game. Yes, I played on normal: I thought maybe those stickers were only available if you played on normal. Replayed the entire game, still did not get all the stickers. Rated 3 out of 5 by pennmom36 from I LIKED FANTASY QUEST BETTER AS A MATCH 3 GAME In the first episode of Fantasy Quest, an evil sorcerer cast a spell that sucked all of the magic out of the fairies enchanted kingdom. The fairies became ill afterwards, and needed help to heal and free them. In the second episode of Fantasy Quest, the fairies were once again faced with a calamity, when a dark shadow was cast over the kingdom. The Holy River was poisoned and the fairies and animals who drank from the poisoned river became deathly ill. In this third episode of Fantasy Quest, the Holy Tree have been healed, the Towers reactivated, and they have restored the kingdoms equilibrium. The King has asked the fairies to assist him, by completing 9 very important tasks. (hey, at least they're not ill!) For some reason, they have changed this Match 3 series to a Solitaire game, and it didn't work for me. I actually liked the Match 3 games, and although I love a good game of Solitaire, this one is no different than Zombie Solitaire, and is far too easy at that. There are still Match 3 levels available, as well as HO"s and Time Management levels, to give you a break from Solitaire, but I'd rather it be the other way around. This is a Higher/Lower type solitaire game, available in a Casual or Normal difficulty mode which allows you to earn more money. There is a Star Meter at the top which shows you how many cards you'll need to remove before earning each star. If you earn 3 stars on a level, you will earn an extra Undo. Some cards contain Collectible Stickers in four different categories, once you find all 5 stickers in a group, you will receive a reward. As you remove cards, coins fall to the ground, and they have added an option to enable or disable the coin bounce feature, that drove some players crazy in Zombie Solitaire. You can use the coins in the Shop to buy cards to help you win, such as a Fairy Spell Card which removes 1 card of your choice, a Twin Lightning Card which shoots down 2 cards of your choice, a Powerful Curse Card which removes an entire row of cards or a Mighty Redeemer Card which allows you to click on cards to remove them, while active. 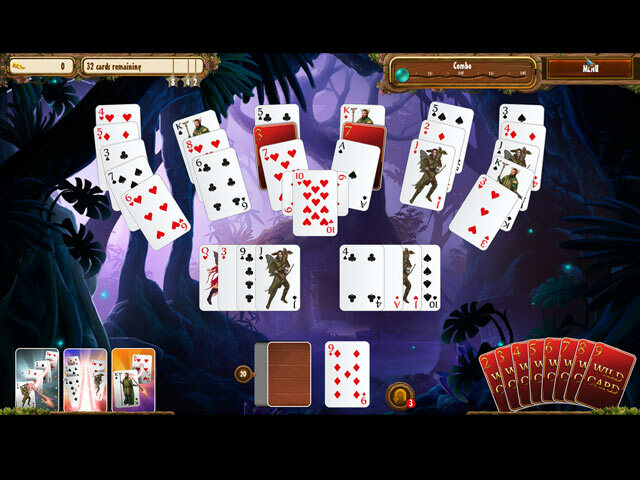 You can only arm yourself with 3 different bonus cards per level, but occasionally, these bonus cards are available on the levels as part of the solitaire game. You can also buy extra Wildcards that are number specific, but you will also earn them on some levels, a single click will remove them from the board, to use at any given time or level. There are Nuisance Cards eventually that block some cards from being played until you uncover the a appropriate Fairy Card to unblock it. There are Cloud Covered Cards, Rock Covered Cards and Cards Covered in Thin Ice that require you to uncover and use the Turquoise, Red and Blue Fairy Cards, before you can include those cards. The Match 3 game is a Swap type M3 with Limited Moves, that can be played in a Casual or Normal mode as well, but you won't be able to earn more than 1 Star in Casual Mode. Large Matches will give you power-ups such as a M4 will give you a Bomb, a M5 will give you a Rocket, and making a M3 of 2 different tiles in the same match, gives you Lightning. The power-ups can be activated with a single click, and the object is to make matches of the same tiles encased in bubbles around each fairy, to pop them. 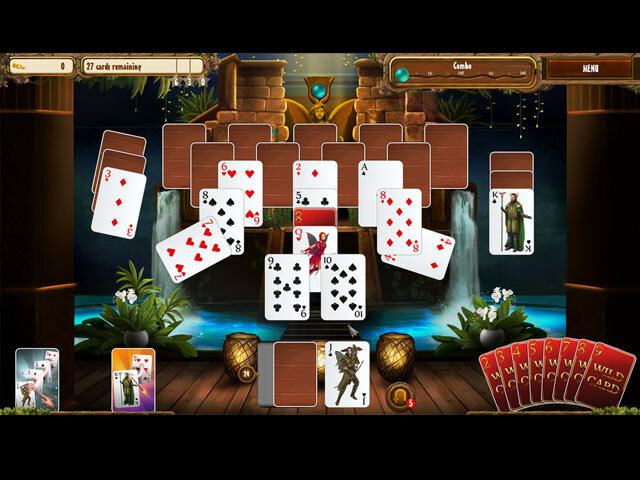 FANTASY QUEST GAMES AVAILABLE Title***Release Date***Type***Average Rating *Fantasy Quest 1---April 8-2014 (Match 3) 3.6 *Fantasy Quest 2---April 5-2016 (Match 3) 3.3 *Fantasy Quest 3---January 29-2018 (Solitaire) n/a by:Rokapublish For me personally, I found the Solitaire and Match 3 levels to be far to easy, and that was while playing in the Normal Mode. You earn too many coins too easily, so its easy to buy Power-up cards that make it nearly impossible to win. If you like Zombie Solitaire, you will like this one too, but I already have both ZS games and this one has nothing new or different to add, even the zombie moans are still present which makes no sense to me, so I'll pass. Rated 2 out of 5 by Hooford1 from Unimaginative Zombie Duplicate Sometimes in a new game you notice out-of-place music or graphics that you recognize from other games, but this is really a blatant reworking of the Zombie series. If you have never played the Zombie series, you might like this game, or perhaps buy Zombies instead. Otherwise save your coins for a more deserving Quest. I rated Visual and Sound as good, which they are, if you ignore the fact that you have heard it before.